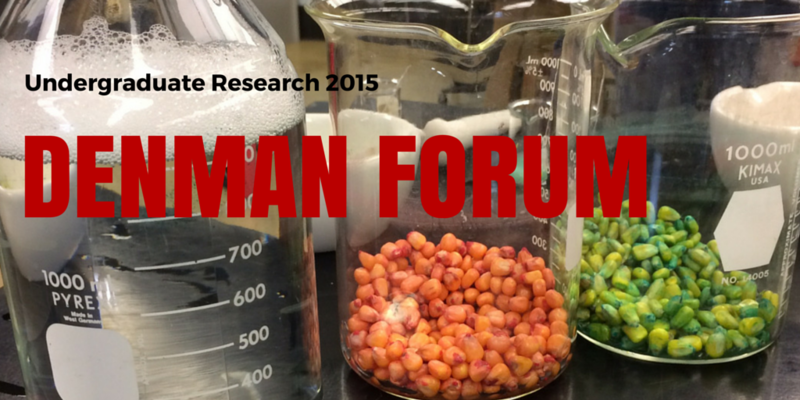 The 20th Annual Richard J. and Martha D. Denman Undergraduate Research Forum was held on March 25, 2015. More than 600 students in all disciplines will be presenting posters on their research and creative activity projects. To learn more about the Denman, check out the website: denman.osu.edu. Four Sustainable Plant Systems majors presented posters at the event. Matthew Willman and Darren Sommers were awarded 3rd in the Agriculture/Environmental Science category. For more winners, see the Undergraduate Research website. The abstracts of the four Horticulture and Crop Science presenters are posted below. Agroinfiltration is an efficient tool used to rapidly assess plant gene function by transiently expressing DNA of interest. In agroinfiltration, we take advantage of a complex and naturally-occuring DNA transformation mechanism belonging to a bacterium from the genus, Agrobacterium. Agrobacterium cells are forced into plant tissue in order to introduce and express desired genes in the plant. Agroinfiltration is commonly utilized for gene function studies such as gene silencing or overexpression. Despite wide use of agroinfiltration in a number of plant species, the technique only recently because available for soybean (Glycine max), and efficiency improvements are needed. In agroinfiltration, variation in transient expression has been observed among Agrobacterium strains; therefore, a novel strain may provide improvements. As compared to commonly used laboratory strains of Agrobacterium, a newly acquired strain, JTND, has been characterized as possessing higher transient expression rates in soybean explants and embryogenic tissue cultures following infiltration. Thus, this strain may also exhibit a higher rate of transient expression in agroinfiltrated soybean seedlings. The JTND strain was disarmed to remove plant tumor inducing genes, and the disarmed strain was named SBHT. In this work, we aim to assess the transient expression rate of SBHT in agroinfiltrated leaf tissue from soybean seedlings. Transient expression rates from agroinfiltrated soybean primary leaf tissue will be compared by image analysis of the expression of a reporter gene, beta-glucuronidase (GUS), for SBHT and two check strains which exhibit the current highest measured transient expression levels in soybean. Three experimental replicates will be completed and evaluated. Evaluation of one replicate will be presented at the Denman Forum. If shown to give higher transient expression rates than previously evaluated Agrobacterium strains, SBHT will provide researchers with an improved Agrobacterium strain for use in soybean gene function studies. In Africa soybeans (Glycine max) serve as a dietary source of protein via soymilk and soy flour. Africa currently produces ~1.5 million tons of soybeans, and imports a similar amount. Increased soybean production has been proposed as a partial solution for malnutrition in Sub-Saharan Africa. Developing soybean cultivars with maximal protein production per hectare (protein yield) may be part of this solution. Because crop production in Africa is often limited by unpredictable environmental constraints, protein yield would need to be stable across environments. Previous studies have evaluated genotype-by-environment interaction (GEI) and stability of yield for soybean cultivars, finding that high yields are often associated with high yield instability. However, there has been little research on GEI of protein yield. We are investigating the relationship between protein yield and the stability of protein yield. This study aimed to determine seed protein content, protein yield, yield, and their correlations (positive, negative, or neutral) with the stability of each of these traits. We hypothesized that protein yield would be positively correlated with protein yield instability. Three replicates of 114 breeding lines were grown in four Ohio environments. Seed protein content, determined by Near Infrared spectroscopy, protein yield, and yield were assessed. Stability indices were generated using the Eberhart-Russell method, indicating levels of stability of each cultivar across environments. Correlations between protein content, protein yield, and yield and their stability indices were positive, but insignificant. This indicated that cultivars with high protein yield may exhibit stable protein yields across variable environments. Thus, increasing protein yield may be one component of addressing malnutrition in Africa and warrants further research. DuPont Pioneer has developed a soybean trait that gives soybean grain high oleic acid composition. Plenish varieties have high oleic acid content, making it a healthier source of oil. However, there is little information if the application of manganese to Plenish soybean would affect the composition of oleic acid, oil, and protein in the grain. In a full factorial, randomized complete block design experiment, four replicate of different soybean varieties including Plenish and non-Plenish and three manganese regimes were carried out in two different locations. When soybeans reached R2 growth stage, leaf tissues were analyzed, in which the amount of manganese concentration range from 16 to 69 ppm. After harvesting, seeds from all different treatment were analyzed for fatty acid, oil, and protein percentage. By comparing the result between two different soybean varieties, Plenish seeds contained higher percentage of oleic acid, oil, and protein, with a lower percentage of linolenic acid; whereas, non-Plenish seeds contained higher percentage of linolenic acid, oil, and protein, along with a lower percentage of oleic acid. Yet, there were no significant effect of manganese application on both Plenish and non-Plenish seed quality. Nevertheless, when leaf manganese levels were low (less than 21 ppm), there was significant effect on the grain yield for both Plenish and non-Plenish varieties. In short, the results show that levels of manganese do not affect the seed quality, but affect the yield when manganese is deficient. Therefore, this experiment acts as a decision tool for soybean growers in applying manganese fertilizer especially when Plenish soybean variety is planted since there could be a significant influence in the soybean yield. Efficient and profitable field production of arugula requires that all or nearly all seed produce healthy seedlings and plants. This rarely occurs in practice due to stand establishment-related issues, such as improper seed placement and density (depth, spacing, number). Planting implements and procedures influence seed placement. This study examined the effects of tractor speed on arugula stand establishment and yield. A central Ohio, certified-organic vegetable farm served as the study site in Summer-2014. Previously, a Sutton Jr-model precision seeder was purchased to enhance stand establishment. Optimal settings for the seeder were unknown. Two trials (each utilizing 12‐bed blocks with standard commercial beds measuring 120 feet long x 3.5 feet wide x 0.5 feet tall) were conducted. Seeds were delivered to duplicate sets of beds at tractor gearings of 1250 RPM/1.6 MPH, 1400 RPM/1.8 MPH, 1550 RPM/2 MPH, 1700 RPM/2.2 MPH, and 1850 RPM/2.4 MPH on July 1 and 13, 2014 (one gearing per bed). The manufacturer’s suggested starting speed was 2 MPH (1550 RPM) and served as the experimental control. The desired planting density was 24 seeds per foot. The number of seeds delivered was 72 seeds/second/planting shoe with a #6 seed plate. This was determined prior to July 1 in timed trials involving seed delivery, excavation, and counting. A sample sub-plot was established in random locations within each bed immediately after sowing. Plant emergence (number x day) and biomass (weight) within the sample sub-plots were monitored through horticultural maturity. Reducing tractor speed 17% (i.e., from 1500 to 1250) resulted in the highest percent stand establishment (percent of viable plants relative to the number of seed sown). The fastest tractor speed (1850 RPM) resulted in the lowest percent stand establishment. We were unable to resolve treatment effects on crop yield due to pest pressure.